POPLARVILLE, Miss. (AP) — Six foals sired by a cream-colored stallion called DeSoto scamper across a pasture in southwest Mississippi — the first new blood in a century for a line of horses brought to America by Spanish conquistadors and bred by Choctaw Indians who were later forced out of their ancestral homelands. “That really gives us a shot in the arm,” said Bryant Rickman, who has been working since 1980 near Antlers, Oklahoma, to restore the line. He estimates he has bred more than 300 of the horses from nine mares and three stallions. But having so few stallions led to a bottleneck, because the gene pool was so small. Choctaws saw great power in horses. Ian Thompson, tribal historic preservation officer for the Choctaw Nation of Oklahoma, said their word for horse, issoba, means “like a deer” — and the deer was the tribe’s most important animal, both economically and spiritually. “So naming the horse after the deer was really saying something,” Thompson said. 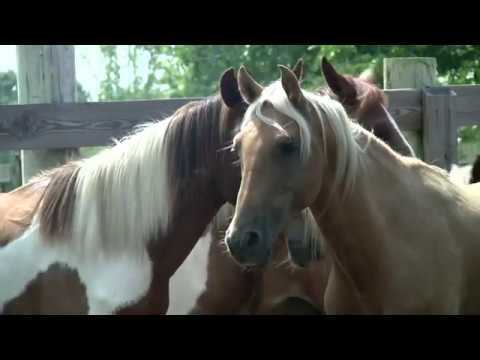 Choctaw horses are descended from those brought to the United States in the 1500s and later by Spanish explorers and colonists, said Dr. D. Phillip Sponenberg of the Virginia-Maryland College of Veterinary Medicine at Virginia Tech. It’s one strain in a breed called Colonial Spanish horses, often referred to by the misleading term “Spanish mustang.” Colonial Spanish horses are among the world’s few genetically unique horse breeds, and are of great historic importance to this country, Sponenberg said. The Choctaw nation lived in much of what are now Alabama, Mississippi, and Louisiana. Choctaws owned tens of thousands of horses by 1830, when Congress gave President Andrew Jackson the power to force Indians out of lands east of the Mississippi, Thompson said. The relocation of Choctaw, Cherokee, Chickasaw, Muscogee, and Seminole Indians to Oklahoma, which has come to be known as the “Trail of Tears,” took decades. Thompson said more than 12,000 Choctaw people made the journey but an estimated 3,000 to 4,000 died along the way. In Oklahoma, the Choctaw and their horses were part of the cattle-ranching economy. The horses are small but tough and durable. “They’re very people-oriented. They’re just as docile as your favorite dog,” said Rickman. DeSoto was discovered in 2005 when Sponenberg visited Poplarville to check out small cattle descended from Spanish colonial stock. He was surprised to find Spanish colonial sheep, there, too. Then came the day’s biggest surprise. “Out of the woods came this horse, single-footing,” he said, referring to a smooth gait between walking and galloping, rather than the bouncing trot common to most horses. Bill Frank Brown was 14 when he inherited the Poplarville farm that Sponenberg visited in 2005. The farm had been in Brown’s family since 1881 and the livestock there, even longer. Brown had three stallions back then, including DeSoto. He called them pine tacky horses. The Texas A&M veterinary school tested samples of the stallions’ DNA, and they matched those of Rickman’s Choctaws. Two of the stallions have since died, leaving only DeSoto. Sponenberg picked the mares that would be the best genetic matches for DeSoto, and they were brought to Mississippi last year. The Browns say some of the offspring will remain in Mississippi while others will go back to Oklahoma, along with pregnant mares.